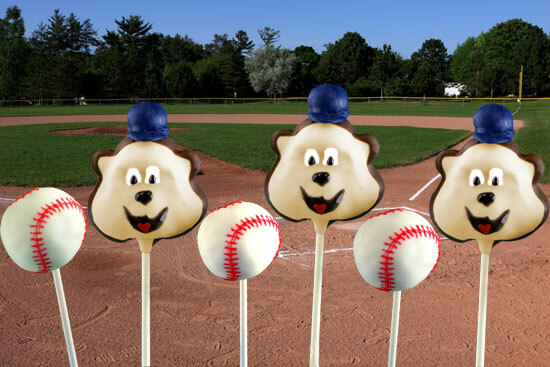 Show your Minnesota Twins pride with these adorable mascot cake pops! For Bears:1. Prepare and bake cake mix as directed on box; cool completely. 3. Use fingers to shape cake ball mixture into a bear head (use a picture as a guide if necessary). Stick 2 almonds into the sides of the cake ball as ears. Chill for approximately 1-2 hours in the refrigerator. 4. Break off 2 squares (4 oz) of Vanilla CANDIQUIK®; set aside. Melt remaining CANDIQUIK® in Melt and Make Microwaveable Tray™ according to the package directions. Add a couple drops of yellow food coloring (oil or powder based) to produce an off-white/tan color. 6. Once dry, use a toothpick dipped in Vanilla CANDIQUIK® to draw the outline of eyes. Use the black cake decorating gel or edible marker to draw on mouth, nose, and pupils. Attach a red heart sprinkle as the tongue. 7. Melt Chocolate CANDIQUIK® in Melt and Make Microwaveable Tray™ according to the package directions. 8. To add the brown “fur” trim; carefully dip the back of the bear cake pop in the Chocolate CANDIQUIK and slowly roll the cake pop around, coating all edges. Allow excess coating to drip off and return to Styrofoam block to set. 1. Melt the remaining 4 oz of Vanilla CANDIQUIK®. Add blue (oil or powder based) food coloring. Spoon small, round dots onto wax paper (bills of the hat). 2. For the dome of the hats, chop a round candy in half; insert a toothpick into candy and dip in the blue CANDIQUIK®. Quickly attach the dome of the hat towards the back of the bill. Once set, use a dab of CANDIQUIK® and attach to cake pop.